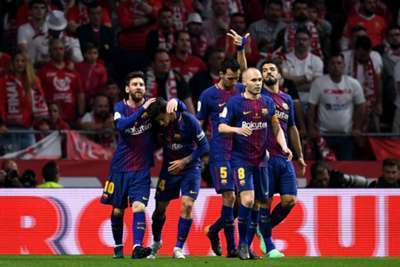 Barcelona were at their ruthless best as Luis Suarez and Lionel Messi inspired a crushing 5-0 win over Sevilla in the Copa del Rey final, with Andres Iniesta capping what is expected to be his last final in Spanish football with a fine goal. Spain and Barca icon Iniesta is reportedly set to depart for a Chinese Super League side at the end of the season and he rolled back the years with an excellent individual display, while Suarez and Messi led from the front in an emphatic triumph to give Ernesto Valverde his first trophy at the club. It took less than a quarter of an hour for Barca to break the deadlock through Suarez, rounding off a route-one move. They ultimately went into the break 3-0 up, as Messi fired home and then set up the lethal Suarez for his second, as Sevilla were left looking at a damage limitation job. And things got worse for them early in the second half. Iniesta, who had earlier hit the crossbar, finished off a brilliant move with a smart finish to mark a momentous occasion in fitting style. Philippe Coutinho then got in on the act, converting a penalty to add gloss to a remarkable evening for Valverde's five-star Barca, who are closing in on a domestic double. Having seemingly learnt the lesson of their slow start against Sevilla in last month's 2-2 draw in LaLiga, there was nothing slack about Barca this time around, as they quickly suffocated the Andalusians. As such, there was more than a hint of inevitability about their opening goal in the 14th minute. Spotting Sevilla's defence playing a high line, Jasper Cillessen drilled a long pass over the top for Coutinho to run on to and he squared across the face of goal for Suarez to knock home. Sevilla responded fairly well, but Barca remained on top and nearly got a second when Iniesta struck the crossbar with a left-footed drive from just outside the area. They did not have to wait much longer, however, as Jordi Alba cut the ball back to Messi with a clever backheel just after the half-hour mark and the Argentina star emphatically smashed home. It got even uglier for Sevilla just prior to the break – Messi played a perfectly weighted pass through for Suarez to latch on to and the Uruguayan clinically fired past the helpless David Soria. Barca started the second half rather more relaxed, though they soon clicked back into gear and opened up a four-goal lead. Iniesta robbed Ever Banega of possession before exchanging passes with Messi on the edge of the area, rounding Soria and finding the net from a tight angle. Former Barca youngster Sandro Ramirez provided a little extra spark in the Sevilla attack after his half-time introduction and should have got a consolation in the 64th minute, but after a lungbusting run he shot straight at Cillessen. Clement Lenglet, who has been tipped to join Barca for next season, then handled in the penalty area with 21 minutes to go and Coutinho coolly slotted home the resulting spot-kick. The Barca support were given one last reason to cheer as they gave the substituted Iniesta a standing ovation as he left the pitch, with their Sevilla counterparts joining in as the Wanda Metropolitano showed its appreciation for one of the greatest midfielders of recent times. - Barcelona have won the Copa del Rey 30 times, at least seven more than any other team in the competition (Athletic Club, 23). - Lionel Messi is the second player in Copa del Rey history to score in five different finals (six goals). The first player to achieve this feat was Telmo Zarra between 1942 and 1950 (eight goals). - Barca have won the Copa del Rey for the fourth year in a row – it is the first time in their history they have won the competition in four consecutive seasons. Indeed, Barcelona have become the first team to win it four times consecutively since 1933 (Athletic Club, four titles between 1930 and 1933). - Andres Iniesta has scored in a Copa del Rey final for the first time ever. Besides, it is his second goal in a final for Barcelona, after 2011 vs Real Madrid in Supercopa. - Luis Suarez has now scored in all the finals he has played for Barcelona in all competitions (Champions League, UEFA Super Cup, FIFA Club World Cup, Supercopa and Copa del Rey).